Trusted Reviews has reviewed an exciting (if you to record videos under water) HD camcorder from Sanyo. 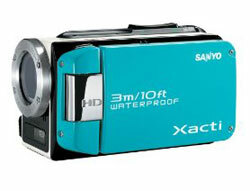 The camcorder is called Sanyo Xacti VPC-WH1 and is able to record HD movies down to 3 meters. Trusted Reviews ends up giving the Sanyo Xacti VPC-WH1 an overall score of 8 out of 10 points. The camcorder scores highest on value, while a little lower on image quality and features. It is able to take pretty nice videos when there are enough good light conditions, but when it gets a bit darker more grain become visible. Read the full review of the Sanyo Xacti VPC-WH1 camcorder here.